Episode 11: "The Final Curtain"
Charlie Chan is visited at his hotel by a gentleman introducing himself as the Earl of Latham. Chan, noting his cufflinks are marked "PR," states that his real name is Philip Royce, an actor who Chan recalled seeing on stage a few years before. Mr. Royce has come to Chan seeking his help to protect his daughter, Barbara, from whom he has been distant for years, from a swindler named Johnny Douglas who preys on young, wealthy women. He states that he learned of Douglas from a woman named Claire Harris. It turns out that Johnny is actually a partner in crime with Claire. It is she who sets up women for Johnny to then take advantage of with the pair splitting the take in each swindle. In this case, however, Johnny has actually fallen for his intended victim and wants to end his relationship with Claire. Miss Harris states in no uncertain terms that if she can't have Johnny, no one will. Arriving at Claire's apartment, Chan with son, Barry, questions Claire about Johnny. After admitting to Chan that she and Johnny had had a shady dealing with another young woman, Chan, satisfied with the information gained, departs. Royce pays a visit to his daughter, Barbara, apologizing for not having been a good parent. Trying to warn her about Johnny, Barbara is angered, asking her father to leave. At his hotel, Chan receives a telephone call from Royce who tells him that he has arranged to have Johnny meet him that night at his apartment. As Chan warns him against this idea, there is a knock at Royce's door. Setting down the telephone receiver, he sees who it is. On his end of the line, Chan hears Royce speaking with Douglas and then a gunshot sounds. Later, at Royce's apartment Inspector Duff states his belief to Chan that the case is open and shut, ordering the arrest of Douglas for Royce's murder. Chan, however, is not convinced, feeling that the window of Royce's fourth-floor apartment and a water tank below have played a role in the mystery, perhaps an avenue of escape for the killer. Douglas visits Barbara who is visibly colder toward Johnny. Chan and Duff suddenly arrive with the news of her father's murder. Barbara, faced with the circumstantial evidence before her, believes that Johnny is guilty, despite Douglas' emotional denial. 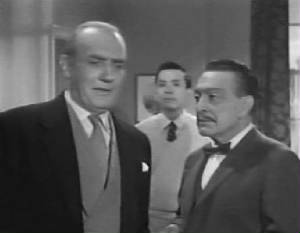 At Scotland Yard, Johnny is questioned by Inspector Duff. Claire is brought in as well for questioning, denying Johnny's claim that he had visited her at about the same time as the murder occurred. An angered and betrayed Johnny lunges for Claire, but he is stopped and taken away. Duff, asking Chan if he is convinced yet as to Johnny's guilt, states that he is convinced only that "with woman like Claire for friend, he has no need for enemy." Back at their hotel room, Barry comes to the realization that it was actually Claire who shot Mr. Royce, then hoping to frame Johnny for the crime. She must have used a tape recorder, he feels, to produce Johnny's voice during the murder. Barry then hatches a plan to seek evidence at Claire's apartment, involving the use of two bottles of champagne to gain entrance to her apartment. Chan warns his eager son that "bubbly champagne very, very sneaky." Later, at Claire's apartment, a dead drunk Barry passes out, having fallen far short of his goal. The next day, Chan and a hung over Barry await the arrival of Inspector Duff at Royce's apartment. Duff arrives and states that witnesses did, indeed, hear a splash of water following the sound of the gunshot, thus proving Chan’s theory that the killer could have escaped through the window and into the small water tank below. Questioning Barbara Royce, Chan reveals that her father had actually shot himself in such a way as to make it look as if Johnny had killed him, hoping in this way to protect her from Douglas. Royce had attached a weight connected to his gun by a cord. Using his acting skills and feigning an argument with Johnny, Royce shot himself, his lifeless fingers releasing the weapon with the attached weight pulling the gun across the room, out through the window and onto the water tank below. In reality, the "killer" of Royce – the gun - had indeed escaped through the window. Very wise man said, "Story of nature much more important than study of fingerprints." Role of father very difficult to play without great preparation. Sometimes, cracked boat, when in middle of river, is too late to stop leak. Wise man once said, "Drink wine in proper mood, sing loud in suitable location." Would be exceedingly foolish to seek further when pot of gold has been found at the foot of rainbow. When water is muddy, very difficult to perceive nature of fish. Trying to stop Number One Son when he desires to speak is like holding back ocean with small sponge. Men live together like birds in the woods, but when death comes, each takes his own flight. The obvious and truth rarely identical. No greater pleasure than agreeing with friend's opinion. Delay does not alter bad news. Word of advice from ancient traveler: bubbly champagne very, very sneaky. To learn what is good, thousand days are not enough. To learn what is evil, one hour is more than enough. If you are not sailor, do not use boat hook. After death, man gives up everything he holds. No actor, no matter how great, should ever try to play the part of destiny.